It’s probably the easiest phrase to come out of my mouth. And I promise I mean it when I say it. But how often do we tell someone we will be lifting them and their burdens up in prayer to our God of unfailing love…and then leave the conversation and the moment suspended until the next time we see one another? Why don’t we just pray for each other in the moment? There is something so powerful about prayer. It’s incredibly intimate and indescribably moving. We talk a good game about the Holy Spirit and spiritual authenticity in togetherness. But if we really want to see walls breaking down, impossible things happen, miracles, and growing faith, praying together consistently should be a priority…not an easy, overused offering of praying for one another in the future. In the book of Matthew, Jesus made a promise to His disciples, and ultimately that promise reaches into our story today. He gave the reassurance that He is always with us, “even to the end of the age”, but “where two or three are gathered” He is there in the midst. Yes, we can and should pray on our own, daily, in quiet times of solitude and rest, making it a habit to be talking to God throughout every moment. His Holy Spirit resides in us for that unwavering connection. But the encouragement and strength that happens when two people are seeking His face together is beyond anything we can do alone. We weren’t meant to walk this journey in solidarity. God created us for each other, which is why Church is so important. Small groups are so vital. Friendships and relationships that uplift, deepen our understanding of God’s love and grace, and point us always right back to Him are mandatory in following Christ. If you don’t have those people in your life who you can trust when the going gets tough, who can rejoice with you in God’s blessings and weep with you in the darkest times, all the while believing together that God is GOOD and He WILL do what He says He’ll do, then ask God to provide. He will put you in the path of those who can pour into your life and you can do the same for them. Those are the relationships and friendships that matter. Yes, God speaks to us in our spirit and in our privately and intimately seeking His face. But He reveals Himself through others in the physical sense as well. And when we come together in prayer, when we are so connected to one another in the spiritual realm…we see mountains move. We see impossible things become reality. And we encourage one another to keep pressing on, even if we haven’t seen the end of struggle yet. The story is still unfolding, and the best is still yet to come. Pray often. Pray with hope and expectation of God’s faithfulness and goodness. And pray with thankfulness for how He’s already working. Pray right now. 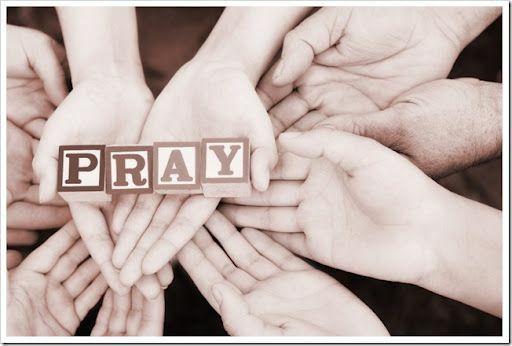 Pray…together.